Now you’re getting used to teaching the new specification, you’re probably feeling more relaxed about planning for your exam classes next year. But now, as many of your pupils head off on study leave, you’ll have some time to go back and refine some of those lessons that either didn’t work as well or need a bit of a lift. To help you do just that, we’ve picked out just some of our favourite schemes of work and planning resources. You can find even more inspiration in our dedicated post on planning for the new specifications. Covering the issue of homelessness and focusing on themes of vulnerability and injustice, Robert Swindells’ Stone Cold is a staple in KS3 classrooms. This complete unit of work offers plenty of ways into the text, including original activity ideas for every lesson. Similarly, this creative writing pack uses extracts from a range of gothic texts to explore the art of story writing within a specific genre. Including all genres from dub performance poetry to Shakespeare’s sonnets, this well-structured scheme is sure to bring verse to life in your classroom. Alternatively, plan and track literacy across younger year groups with the help of this handy pack. Some lessons (PPTs) and resources that I use to teach Stone Cold to KS3 groups. Not all of the resources are originally mine, but I did make all of the PPTs. Apologies for any errors you may find -- I don't catch all my mistakes! MASSIVE success with this scheme. Trouble is, what I can't get on here is the music files I downloaded and threaded into the lessons. If you want to do this, use a site like keepvid.com to download some sinister music - I used the little girls song from 'The Ring' and a series of songs from the original QUAKE video game soundtrack (one is literally just a whisper getting louder and louder). I played these sounds over the top of the creative writing assessment and got a decent response (true, one or two of the kids MAY have nightmares...). Best of luck! A complete unit of work to introduce KS3 students to a wide range of great poetry, from dub poetry performance to Shakespeare's sonnets. Each lesson has a Powerpoint presentation and an accompanying worksheet. Included are lesson objectives, pre-starters, starters, learning activities, application of learning, and plenaries. Differentiation and extension are included where appropriate. Lessons are designed to generate lots of thinking and discussion. Some have carefully structured group work, some ask students to perform, some are based on images from art - each lesson is different and engaging. Students learn as much from writing their own poems as from analysing poems in detail. Also featured are materials to help students achieve their best in an extended essay, which would form a natural assessment activity. Most importantly, everything is easily editable, so you can make it your own. It is complete as it is, but each teacher is different, so it can be used as a foundation for your own planning. A KS3 plan of how to teach, plan and track literacy across the key stage. Each plan tracks the language and grammar skills that students will need for the new English Language and Literature specifications GCSE examinations from 2015. Each document depicts a language, a punctuation and a sentence skill that students will focus on each half term. It also has a clear rationale of how each skills links to the assessment objectives from the exam. It is intended to help staff to target specific skills each half term. There is also a section that details suggested reading activities to be used with class novels. Each activity is linked to Bloom's taxonomy as well as the AO's and are different for each key stage. The year 9 document also suggests how questions can be phrased to link to the new English Language (unseen literature) paper 1. The scheme is intended to be used by a department to aid building literacy into existing schemes of work or to help structure stand alone library/literacy lessons. This ever-popular A Christmas Carol unit contains a wide range of unique activities, such as sympathy graphs and quotations hunts, to enhance the study of Dickens’ classic text. Or, delve into the world of Macbeth with the help of this comprehensive planning booklet. When it comes to exploring English language, this two-week scheme help students to get to grips with critically analysing unseen prose texts, while this 26-lesson pack covers the process of writing creatively from start to finish, touching on idea generation, vocabulary choice and proofreading. A Christmas Carol: Full Scheme & Resources - aimed at GCSE, but easily adapted for KS3. KS4 Shakespeare resource packs contain scene by scene notes on all aspects of the play, story summaries and differentiated worksheets. Areas typically covered include: character, themes, imagery, language, cloze passages, revision questions, written and oral assignments and quiz pages. The workbooks can also be used by pupils for GCSE exam revision. 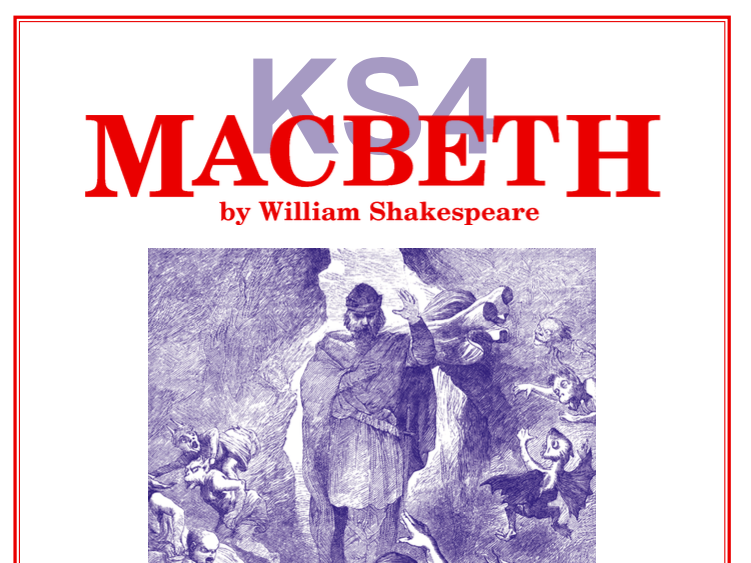 Key stage 4 Shakespeare schemes of work are also available for the following plays: Othello; A Midsummer Night’s Dream; The Merchant of Venice; Romeo and Juliet; The Tempest; Julius Caesar; Much Ado About Nothing; Twelfth Night; Henry V; Richard III. A two week (8 lesson) scheme of work introducing students to Paper 1, Section A (Explorations in Creative Reading) of the new AQA English Language GCSE. The aim is to introduce students to the format of the exam and teach them the skills needed to analyse unseen prose extracts to be able to answer questions 1-3. The scheme of work focuses on extracts from the opening of 'Fahrenheit 451', 'From Russia With Love' and 'The Night Circus' - I have not been able to upload these due to copyright restrictions but they are available online. The James Bond extract can be found here: http://thrillers4u.com/20_ian-fleming-from-russia-with-love-dr-no-and-goldfinger_extract.html and the 'The Night Circus' extract is from the opening page of the novel. A full scheme of work is included with detailed guidance and notes to outline the structure of each lesson. In addition to this, each lesson is fully planned and resourced as a PowerPoint presentation - over 100 slides for the two week unit. This is a PowerPoint presentation that contains 26 lessons, of 60 minute each for the new 9-1 English Language GCSE's. The lessons cover idea generation (with and without visual stimuli), planning, creating effective narrative and descriptive, organising paragraphs, creating interesting openings, writing monologues, writing for a specific audience and purpose, appropriate and effective vocabulary choices, using a range of sentence types for effect, use of a range of punctuation for effect, proofreading skills as well as 2 different practise assessments. This PPT can be differentiated up or down with ease (a few GATE extensions have already been included in the presentation). This SOW was created to the Edexcel exam board requirements. Originally designed for the old specification, this Othello unit still offers plenty of inspiration for exploring the plot, themes and characters of the play. For something more up-to-date, this comprehensive lesson collection is an ideal starting point for enhancing your teaching of the unseen prose question as part of the new exam. Why not introduce pupils to the roaring twenties using this easy-to-follow scheme of work on The Great Gatsby? Alternatively, this detailed presentation offers four lessons’ worth of material, focusing on the most recent studies and theories related to accent and dialect. English Literature A level AQA new spec. Prose extracts preparing students for unseen prose question. powerpoints linked to extracts introducing features of prose. Accent and dialect AS Level lessons NEW SPEC! Full PPT including interactive activities for AS Level students. Focusing on the most recent studies/ theories for the new A-Level spec. Will last 3-4 lessons.